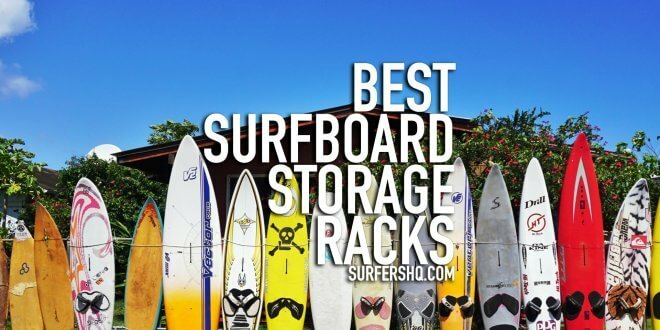 It’s time to take a look at the best surfboard storage racks to protect, safely store (and maybe even show off) your surfboards when you’re not out on the water! When it comes to surfboard storage racks, you want something that is secure, spaced out but still give you quick and easy access to your boards. It should keep them tidied away, scratch and scuff free and make them last longer. 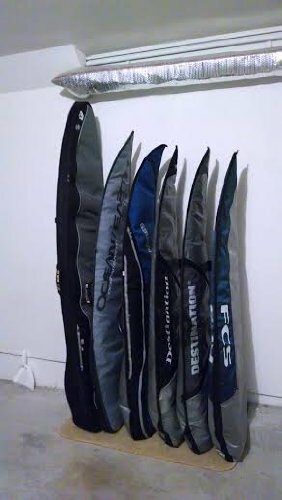 10 out of 10 times I will go for a surfboard wall rack. They look great, don’t take up much space, keep things secure and ding-free. Where you put your surfboards depends on how many you have and how much space you have so you need to factor both of those into your decision making as well. We’re going to take a look at some of our favourite ones. To me this is the best surfboard storage rack you’ll find. 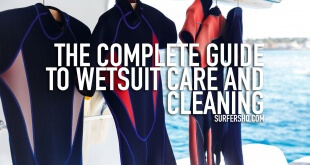 It can store up to 4 boards – including surfboards, wakeboards, snowboards and even wetsuits. Each level of the rack is padded with blue rubber to help prevent or minimise the chance of dings, scuffs and damage while in storage. It is easy to install and the levels of the arms is adjustable so you can accommodate different sized boards and different fins more easily. The T Rax Vertical Surfboard Wall Rack is a great not-so-little storage rack designed for up to 6 surfboard. Unlike the StoreYourBoard wall rack, this one keeps your boards upright which means it can be a little bit easier to grab and go with them when you’re keen to get out. The rack itself is about 40 inches long, comes out about 2 feet from the wall and is very easy to set up and use. You literally just get it firmly attached to the wall. The downside with all vertical surfboard racks is of course that with your longer boards, you might find you have a bit of a height limitation so bear that in mind. 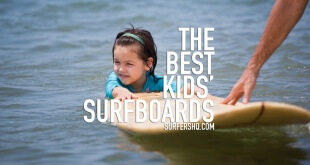 It is also padded to protect your boards and comes with a lifetime guarantee. If height isn’t an issue for you, then as far as vertical racks go, this could be one of the best surfboard storage racks around. 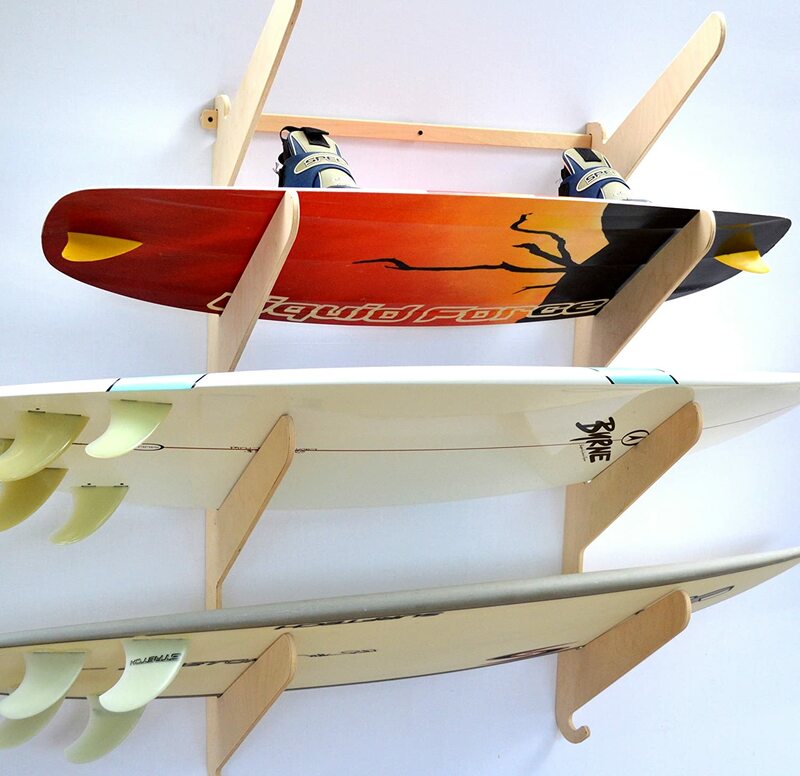 This stylish little rack is there for those who want their surfboards to be a showpiece. They only hold one board but with these ones it is all about displaying your board. This rack is easy to install and because the boards lie flat against the wall, they are ideal for those of you with a small collection and who are short on floor space. And it comes in at a price that certainly won’t break the bank! 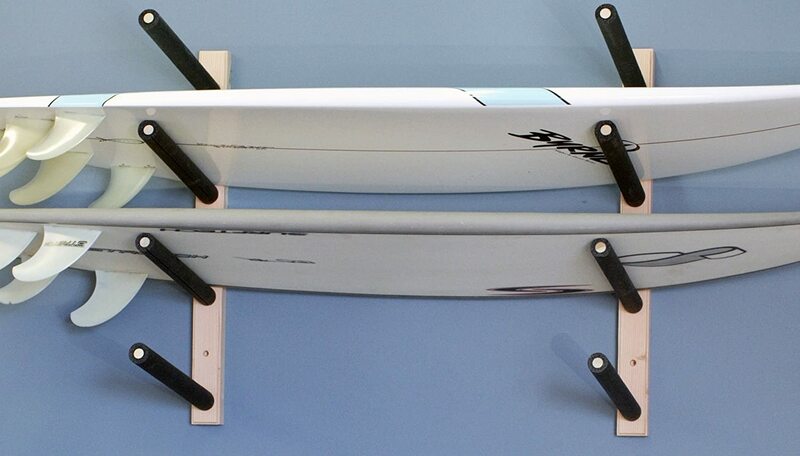 The brackets have soft lining to help prevent damage to the boards while being stored but let’s be honest, the main attraction of this surfboard storage rack is to show off – and why wouldn’t you! 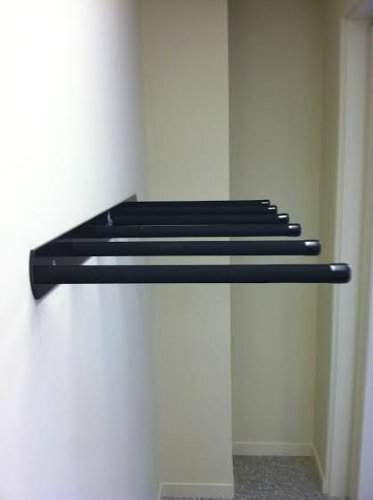 Another simple, practical wall rack to store your boards – this time by Pro Board Racks. Similar in style to the Store Your Boards 4 board wall rack, this one also stores 4 boards and is also designed with padded arms to help keep your boards ding-free. 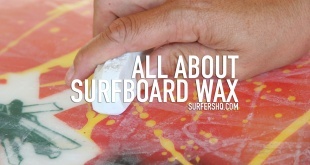 This one is wooden by design, whereas StoreYourBoard’s is metal. Nothing right or wrong with either of those options – it comes down entirely to your own personal choice usually. I personally find metal a bit easier to look after though so there’s my 2 cents on that. It’s also not as adjustable or quite as robust. However, it is stylish, practical and can be a bit easier on the wallet than the metal rival – which are all winning qualities. Ok I have to be honest, in terms of pure style, this is hands-down the best surfboard storage rack we have got listed here. 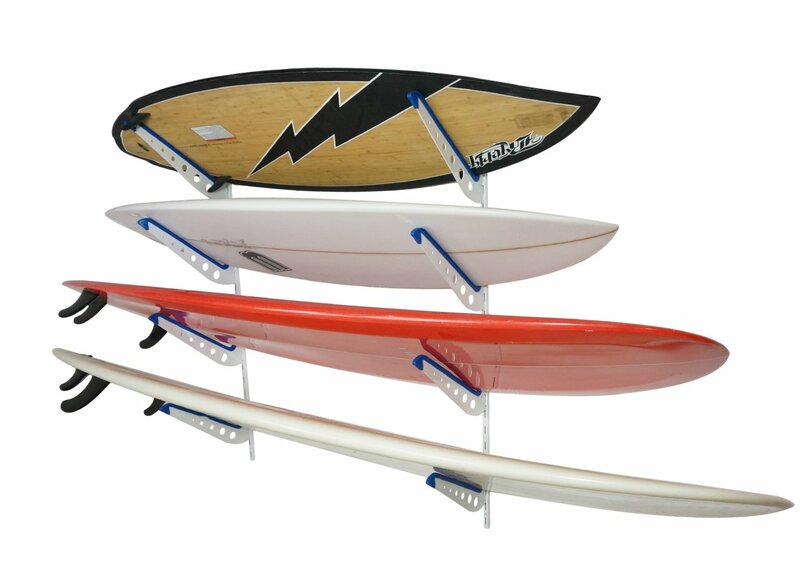 Like some of the other surfboard storage racks we have listed here, this one is also easily wall mounted and stores 4 boards. Like the metal StoreYourBoard one, the boards are tilted upwards meaning they don’t protrude form the wall as much as ones that are lying a bit flatter. It also has adjustable arms so you can customise it as you wish and it comes with an accessory hook so you can keep all your essentials together. The only thing missing is some padding on the arms – which would help keep your merchandise mark-free, but that is something you can easily add on yourself. You will end up paying a little bit more for this one, but it looks so good that it’s worth the price. So there you have it folks – some of the best surfboard storage racks available to buy today. 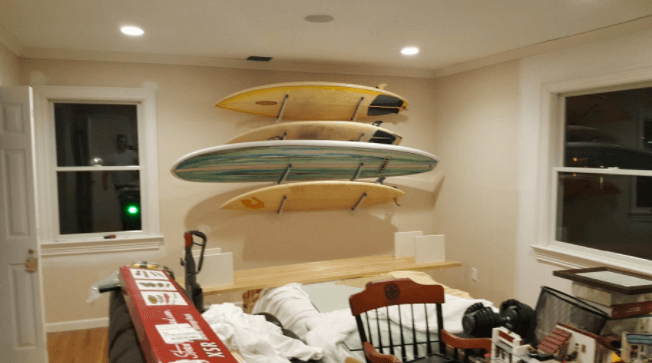 Once you have taken all of those into consideration, you’re in the best position to make a choice and pick up the right surfboard storage rack for you. 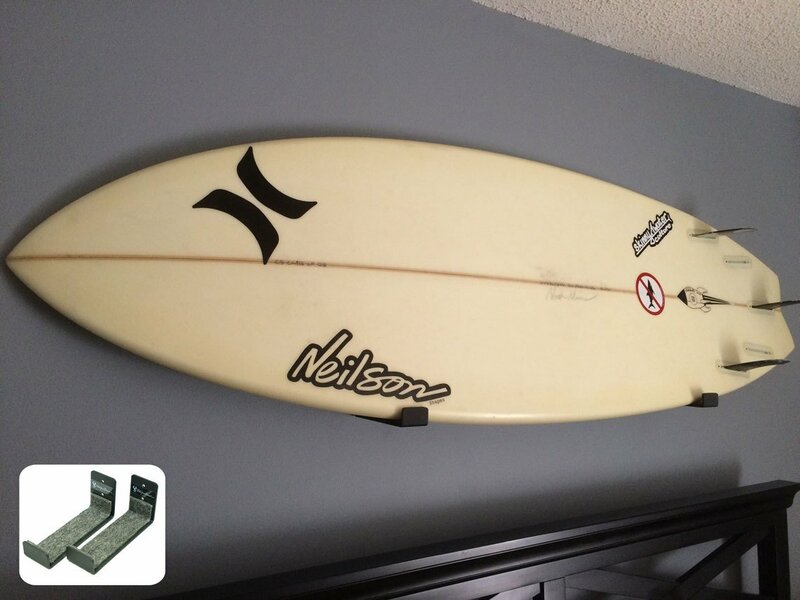 Previous What Size Surfboard Should I Get? 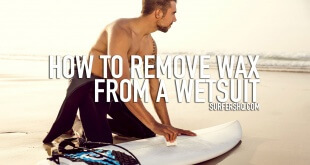 Designed by Web Business Labs | SurfersHQ.com is a participant of the Amazon Services LLC Associates Program, an affiliate advertising program – it is designed to provide an aid for the websites in earning an advertisement fee – by means of advertising and linking to Amazon.com products.